It's commonly reffered to in the shorthand as SYN, SYNACK, ACK. It might make more sense to call it SYN, ACKSYN, ACK. The client SYNchronizes its sequence number to the server. The server ACKnowledges the client's sequence number, then SYNchronizes its own sequence number. The client then ACKnowledges the server's sequence number. It's called a 3-way handshake because there are 3 messages. This exchange costs an entire back-and-forth or Round Trip Time (RTT) between the endpoints before any data is sent . Why is the sequence number important? Detecting when messages are duplicated (I got 3 copies of message 1, I can toss the extras). The receiver can tell the sender when it is missing a message and ask for it to be sent again. Detecting and discarding duplicates means the sender can retransmit without fear of messing up the receiver. Why not just start at 0? For #1, remember that duplicate messages are sent. It's possible a connection closes, and a new connection opens on the same port, but a message from the old connection is in flight. When it arrives, if the sequence number is valid for the new connection, the receiver has no way of telling it's an old message. For #2, imagine Server C trying to impersonate Server B. Server C sends a SYN packet with Server B's IP address listed to Server A. Server A sends a SYNACK to Server B. Server C sends an ACK and guesses the correct sequence number and follows up with a request for to perform some action, the server would assume it was Server B all along. A random number makes guessing the correct sequence number. Sending the final ACK back with the correct sequence number provides evidence that the original SYN sender was actually at the IP it claimed to be. Why not send data with the first SYN packet? Another way to skip the 1-RTT cost would be to just send data with the initial SYN packet. Then the server could respond back with data in its SYN/ACK and we wouldn't have any RTT cost for set up. However, this suffers the same spoofing problem as before. A malicious sender could send a false IP with a SYN packet full of data, and the server would assume the IP was real and take action based on the packet. 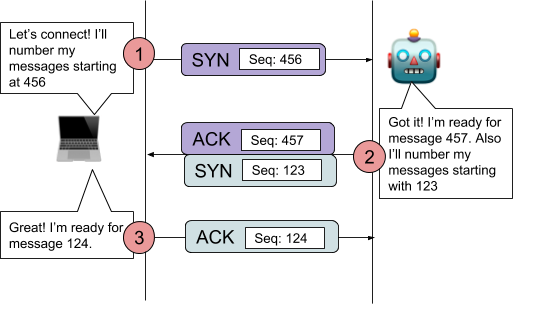 One way that's been proposed to remedy the spoofing problem is to store a shared secret on the first time a connection is made, and then send that with the first SYN packet on the next time. This is called TCP Fast Open (TFO), and you can read more about it in the links below. What's the worst an attacker could do with spoofing the correct sequence number? How does TLS change the connection establishment? Does QUIC use sequence numbers? Stack Exchange: Why not a 2-way handshake?